The good people at Splinter did an interview with me recently. 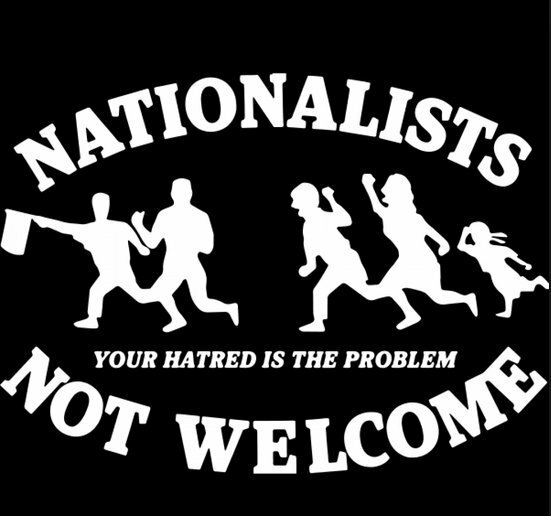 We talk about how many white people hold Alt Right-style views, the different organizing strategies that the Alt Right and Alt Lite use, and what everyday people can do to counter white nationalism. "Let's just be honest: Are 10 to 20 percent of white Americans racist? Yeah, they are." I’m back on the Last Born in the Wilderness podcast, talking with host Patrick Farnsworth about what the Alt Right is up to these days, the Proud Boys gang attack in NYC, and what kind of preparations we should be making as the U.S. continues to spiral into a racist delirium. “One, the mainstream must push back against the demonizing and conspiratorial language used by Trump and others. Mass media outlets must stop allowing themselves to be a conduit for Trump’s lies (and, in some cases, stop actively working to promote them), and cease allowing the spread of demonizing and bigoted ideas in general. For example: Twitter could remove Trump for violating its terms of service, but it simply lacks the will. USA Today had no obligation to print a recent Trump op-ed on Medicare that was filled with lies. Two, we must push mainstream conservatives to break links with the more extreme members of their party. For example, on October 12, a Manhattan GOP club hosted “alt-right” figure Gavin McInnes. This bigot has had a long career of openly calling for violence, and afterwards, his followers (at least one of whom was at Charlottesville) engaged in a gang-style, 30-on-3 attack against counterprotesters. This powerful GOP club in a posh neighborhood should be held accountable for bringing in violent actors. 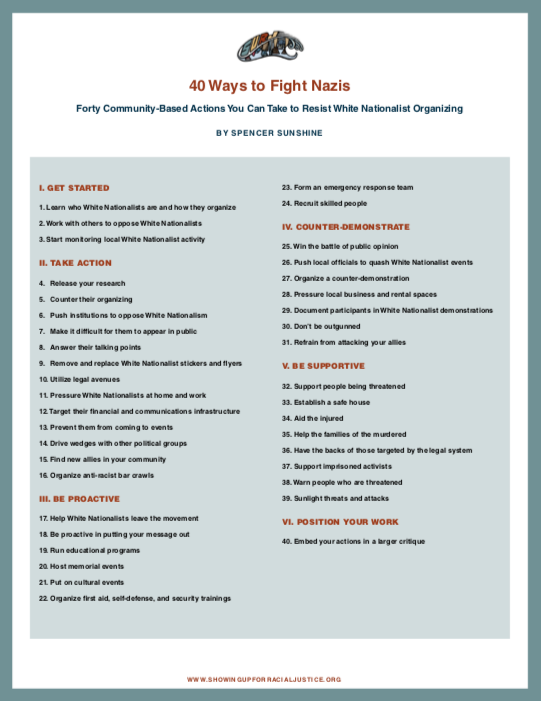 My new guide, “40 Ways to Fight Nazis: Forty Community-Based Actions You Can Take to Resist White Nationalist Organizing” has just been published by SURJ (Showing Up for Racial Justice). It outlines forty legal actions—the majority of which are available to people of all backgrounds, identities, and skill levels—which help to contain and neutralize White Nationalist organizing, as well as the damage it inﬂicts to communities. The guide is availble as a 10-page document, and a 2-page summary that you can hand out at rallies and events.